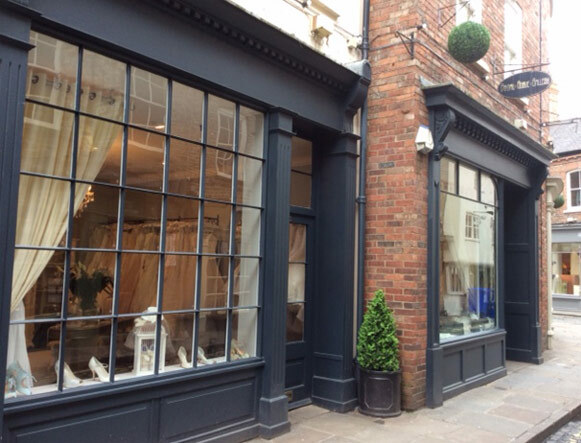 Our York boutique was the second of our three bridal shops and has been open since 1999! The boutique can be found on a quaint little street filled with chic cafes, restaurants and shops, just around the corner from the York minster. The shop has a very feminine style and is spread over two rooms that are intricately decorated with rustic Ivory French furniture. Both of our rooms are easily accessible on the ground floor. Our front room has a selection of jewellery and headpieces scattered throughout glass cabinets and a large shoe display. An elegant chaise long in the middle of the room is perfect to wait on if you arrive early to your appointment, or to rest while trying on shoes. 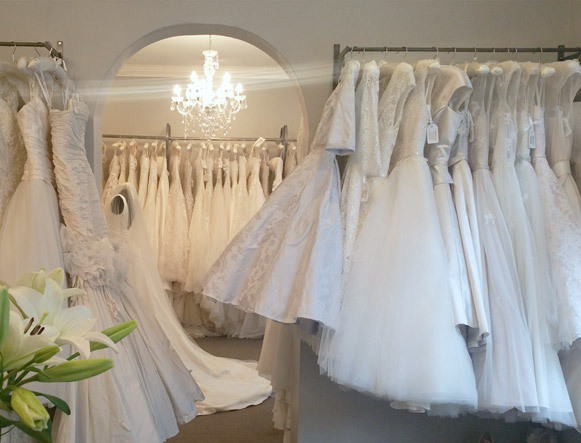 Our second room is full of our beautiful bridal gowns, with three long rails, there are plenty of styles to choose from! A large vintage style mirror sits on the back wall and there are two comfortable seats for guests. Our shop window is lovely to let in natural light but should you prefer a little more privacy we can always close our curtains. In our York boutique we stock dresses from luxury bridal designers; Pronovias, Ian Stuart, Ivory & Co, Blue bridal , LouLou & Ghost. The majority of our dresses in stock range from UK size 8-16, but we can order dresses in all sizes and are happy to advise plus size brides. If you don't find what you are looking for within our main collections we also offer a made to measure service where you can be involved in the design process from start to finish, or alter a current style to suit your needs. We are always open to new ideas and love creating dresses that are individual to each bride. We also have a fantastic range of wedding accessories and aim to provide everything a bride needs to feel fabulous! It is always necessary to make an appointment to view and try on our wedding dresses and accessories. The boutique is located in the middle of town on Grape Lane. The shop is only a short drive from Leeds, Sheffield, Wakefield, Ripon & Northallerton. Our York shop is closed on Sundays.